Caring Transitions of Bonita Springs serves Fort Myers, Immokalee, Bonita Springs, Naples, Cape Coral, Estero and the surrounding areas. We’ve seen the need, both personally and professionally, for the kinds of services Caring Transitions offers ... We are excited to bring this business to our community and be that resource people need. 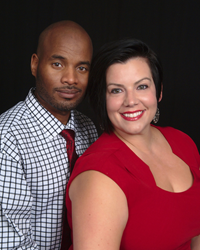 Husband and wife team Cassidy and Samantha Clark, both local Southwest Florida therapists, are pleased to announce that they are combining their professional experience, passion for helping people and entrepreneurial spirits into a new business – Caring Transitions of Bonita Springs. Caring Transitions’ specially trained team can handle organizing, packing, de-cluttering, moving, resettling, in-person and online estate sales, liquidations, and preparing homes for market. Caring Transitions is America’s largest resource for managing senior relocations, but the services are also perfect for busy families and individuals in need of assistance. Caring Transitions of Bonita Springs serves Fort Myers, Immokalee, Bonita Springs, Naples, Cape Coral, Estero and the surrounding areas. “We live in Bonita Springs and have been working as therapists in the social work field for years, providing case management, individual and group therapy to community residents, and providing resources to those in need. We’ve seen the need, both personally and professionally, for the kinds of services Caring Transitions offers. We have seen too many situations where families needed relocation, organizing, downsizing and other transitional needs, but they felt like they didn’t have anyone to turn to. We are excited to bring this business to our community and be that resource people need,” Samantha said. “Caring Transitions is truly a business that provides personalized support to anyone going through a life transition – a relocation, downsizing, upsizing, divorce or any kind of transition where you are facing with the stresses of life and the stresses of moving. Many of life’s transitions can be stressful… and who better to help you through it than a full service company that’s locally owned and operated by therapists? Let us help you and your loved ones by creating a customized service plan to best meet your family’s needs,” Cassidy said. Samantha and Cassidy said, for them, opening Caring Transitions is really about meeting a need in the community and helping people at a time when they often feel most vulnerable. “We want the community to know that, while this is a business, we’re opening Caring Transitions because we want to make a difference. We want people to have someone they can trust to take the stress out of those life transitions most of us will face at some point in our lives. We are here to help,” Samantha said. Caring Transitions of Bonita Springs is insured and employees have been background checked. For additional information, call (239)273-2650, email SClark(at)CaringTransitions(dot)com or CClark(at)CaringTransitions(dot)com, or visit http://www.CaringTransitionsBonitaSprings.com.